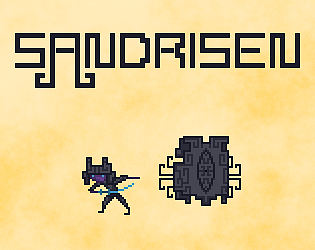 IMPORTANT NOTE: For the purposes of judgement for the GMTK game jam, please download Sandrisen.zip. Sandrisen v1.1.zip is an updated version, with features added post-jam. Enemies fly toward the guardian, which you, as a player, must protect. However, the guardian is also the only one who can destroy enemies. Your sentinel can pick up items, scout for incoming enemies and bodyblock them. Moving your sentinel also makes the guardian attack, and the sentinels position is relevant to the guardians dash, which can be used to escape from enemies as well as destroy enemies in a line. Energy is used to recharge your dash meter. It's also a form of "health" (if it reaches 0, you die) and your score (alongside time survived and enemies destroyed). Powerups briefly change some of the mechanics, as well as give you some extra energy. Enemy sentinels are your only source of energy, but, if allowed to reach the guardian, they will damage it, lowering your energy. Pretty cool! I am a bit of a sucker for games with a dash mechanic. They're just really fun! My only gripe is that the energy should just come to you instead of just sitting their for your sentinel to pick up. It makes it too hard. I loved it. I will echo the gripe on the camera, though. I also feel like the energy drops are a bit too sporadic, unless I was just missing some. Felt like it was really easy to dig yourself into a hole. Awesome take on the theme! I love how you connected movement with attacking, and then added an extra layer on top to give the position of the sentinel more meaning. My only gripe is that the camera doesn't exactly help me see oncoming enemies. Nice that you added a tutorial!